Decision No. 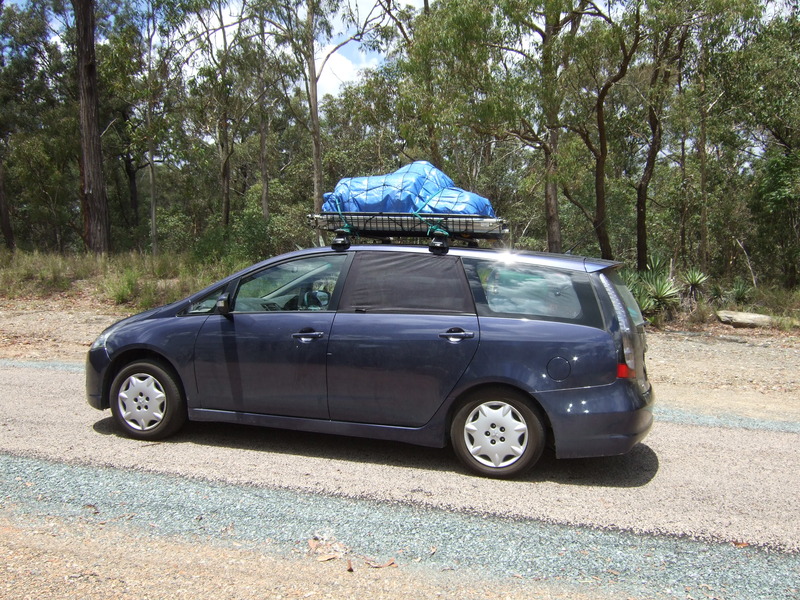 1 – What Car for the Trip? Warning: Looooooong Post! The idea was to update this blog as we made these decisions as separate chronological posts, now I have to cover it all retrospectively, so grab a cuppa and dive right in! Originally we had planned to get the camper first, give ourselves time to pay it off, and then get the 4wd. I guess this was where we learned our first lesson, tow ball weight. and while the Grandis had an 1800kg tow rating, it had a ridiculous 45kg ball weight limit. Working on the general rule of thumb that the ball weight will be approximately 10% of the camper weight, there was absolutley no way we were going to be able to buy and safely tow home/use a camper while we had the Grandis. I test drove a brand new ST-L Pathy, and yeah sure, all the bells and whistles are cool, but to be honest, I found it was ‘not my cup of tea’ to drive. It was pretty clear that the Pathys are based on the Navara drivetrain, it felt very big, very cumbersome and everywhere I looked I saw blind spots (can you ‘see’ blind spots? If a tree falls in a forest…..?) Also starting to look at the availability of spares on the road, the multitude of electronics involved and the Pathy was beginning to lose it’s sparkle. So it was time to seriously consider buying a car that would be older then the one we already had, also a good chance of having almost double the amount of klm’s for a good $15,000 more then what we could sell the Grandis for! Something just didn’t add up! I did some figures on the fuel consumption under tow and it became pretty clear that the diesel was going to save us considerable money in the long run (approx 19L/100 petrol vs 14L/100kms diesel). This was based on getting one of the the post October 2007 Diesel Prados when Toyota introduced the new ‘D4D’ engine with considerably better power/torque and economy. It was time to down sell the petrol and up sell the diesel to the accountant. After considerable research, and watching the market for a number of months, I started calling and making ridiculous offers for available Prados virtually anywhere within 500klm of Brisbane. Reality set in and we were beginning to think that while we have come up with the right car for our requirements, we were simply not going to be able to afford one. 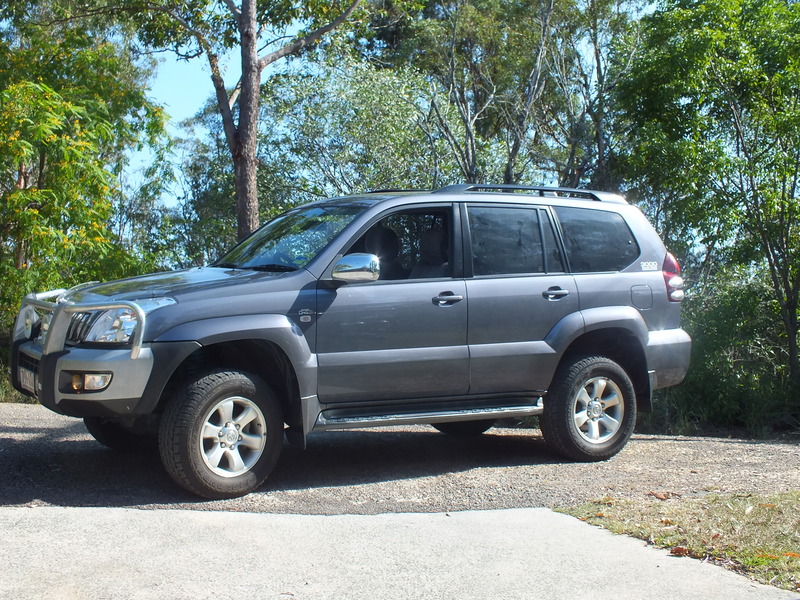 I extended my range to anywhere in QLD and NSW and we found a Dec 2007 120Series D4D Prado waaaaay out in Alpha QLD. Turns out Jess’ parents happened to be baby sitting a station in Moranbah at this time, ‘only’ about 5 hrs away. “Nah” I said to Jess, “we can’t ask your mum and dad to drive over 400klms just to look at a car we might not even buy”. “Just call them and see” Jess said. Me: “Hey we found a car in Alpha that might be a go-er……you don’t feel like a drive do you? Me: “Are you sure? Well let me get an address and find out when they might be free and I’ll give you a call back in about an hour yeah? Seems after 2 weeks out in Moranbah any excuse for a change of scenery was all Stewie needed and he was out the door and on the road! And me cos I just can’t help myself! Jess and Matt! I think you have made the right choice with the Prado. Friends of ours bought a new Pathfinder about 4 years ago and I’ve lost count of the times it has been back at the shop with issues. And the gearbox is crap – it went at Christmas time. I think it uses the same gearbox as their smaller Nissan sedans??? Bec ps. love the blog! Yes, I’m looking forward to the prospect of not having much else to do all day and the idea of a trip ’round the corner’ being just something fun to do for the day. Here I hate it when I have to head down town to get bread or milk because life is so damn full that 20mins to the shop is a great inconvenience! Even I wanted know what happened at the end Matt! Well done! Dad – you are the king of ‘poetic licence’ aka exaggeration so I don’t think you can do any worrying about slandering hehehehe! Lisa – we do love Peter Prado – first car we have really wanted and not just bought something boring and sensible! Yeah first car we have been actually excited about, and 2 weeks after owning it a pole just jumped out of nowhere and hit the back door didn’t it darling…. Oh and a few weeks later Lexi decided that this whole one colour scheme was boring, Peter Prado needed some ‘pin striping’ and yes, that gouge out of the bulbar was because the National Park Service has an unhealthy obsession with bollards…..I swear it wasn’t there when I parked…..oh well, Peter Prado will have many more battle scars in 12mths time I am sure.